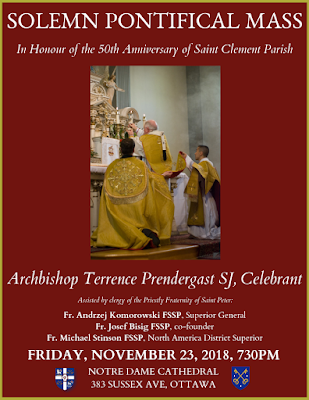 On Friday, November 23, the feast of Pope St Clement I, His Excellency Terrence Prendergast, the Archbishop of Ottawa, will celebrate a Solemn Pontifical Mass in the traditional rite in his cathedral, to commemorate the 50th anniversary of the parish of St Clement. 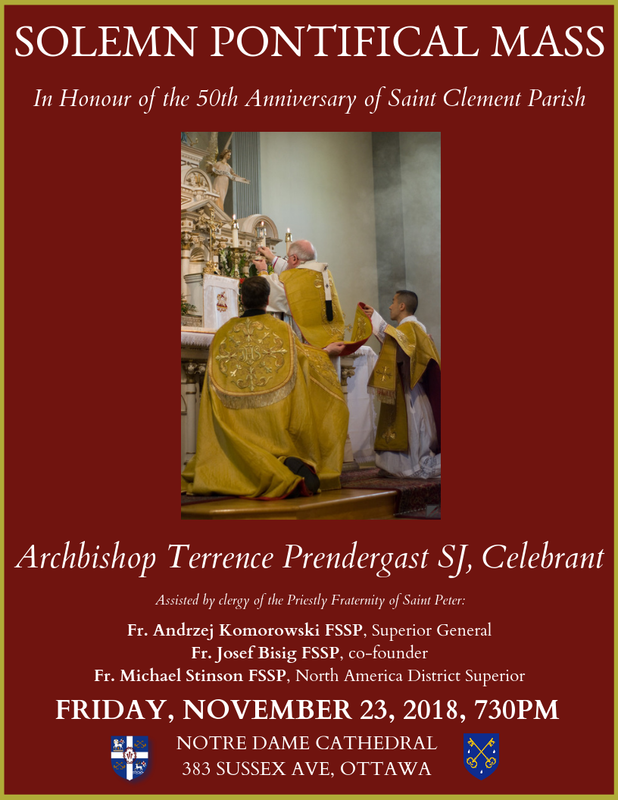 As we noted in an article earlier this year, St Clement, which is now run by the FSSP, was one of the few churches that held on to the celebration of the traditional rite after the promulgation of the post-Conciliar reform. For a ten-year period, it was constrained to use the new rite, and did so according to the mind of the Council, with Latin, chant and worship ad orientem; in 1984, the traditional rite was restored, and has continued ever since. This Mass will be the first Pontifical to be celebrated in the cathedral of Notre Dame since 1998. The ceremony will begin at 7:30 pm; the cathedral is located at 383 Sussex Avenue.